COLOR(S):Brindle, or black with streaking. With or without white markings on chest or feet. 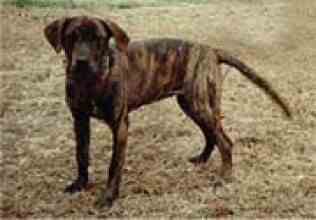 The Treeing Tennessee Brindle is another variation of the coonhounds of America. They are smaller than other coonhounds, however, and only range from around 16 to 24 inches. They have catlike paws, and a choppy bawl for a bark. With small ears and a brindle body, this breed is discouraged from changing size, ear length, tail, or colors so that it doesn\'t also change category. Treeing Tennessee Brindles are good at open trailing and locating prey. Courageous hunters and companions, the Treeing Tennessee Brindle is said to have an abundance of "heart and try." They are a sensitive breed, however, and owners warn never to mistreat the breed. This breed can be more sensitive than normal toward neglect or abuse, and it is thought that once you mistreat them they will never treat you the same again. They are good natured and friendly dogs, getting along with anyone and everyone. This breed is intelligent, alert, and vocal. They love to bark because it is usually their job. The Treeing Tennessee Brindle is a an American breed with a strong work drive and friendly demeanor. Treeing Tennessee Brindles are friendly and active dogs. They get along well with other dogs, as they are usually used to hunt with other dogs. They are also friendly almost any person. Easygoing and good-natured, this breed is also a very hard worker. They are intelligent, alert, and affectionate. This breed is more sensitive to treatment than most other dogs. It is believed of their hearts that, "You can take it out, but you can never put it back." When choosing a puppy, the best personality would be a pup who is bold, happy, confident, and inquisitive. The Treeing Tennessee Brindle is also very vocal. The Treeing Tennessee Brindle should be occasionally brushed and bathed in order to remove dead hair and dirt. Low maintenance is all this breed requires. There are no known health problems particular to this breed. This breed should be exercised regularly to keep them in shape for hunting, as they have a strong desire to hunt. The Treeing Tennessee Brindle breed is not recommended for apartment dwelling. They are highly active and require a rural setting where they can be free to roam, to hone their hunting skills. They enjoy time with their family and prefer to be outdoors. When training a Treeing Tennessee Brindle one should be very careful not to abuse them in any way. These dogs can be particularly sensitive, and may never trust you again if abused. The best way to train this breed is by positive, loving reinforcement that is consistent. Learning Rate: Medium. Obedience - High. Problem Solving - Medium.